Have you downloaded a Coffee Break app from the iOS App Store or the Google Play Store? If so, unfortunately this app is unauthorised and the developers are illegally selling our copyright materials as in-app purchases. Over the past year we’ve been having issues with a group of developers who have stolen our content and made it available through apps on the iOS App Store, and on the Google Play Store. The apps use our logos, and our premium content and are a blatant infringement of our copyright. Unfortunately there is very little we can do about this. We’ve now been through the legal process with Apple on twelve separate occasions. Each time Apple finds in our favour and removes the apps, but the developers simply upload the app again within a few days under a different developer account. These apps are unauthorised and we have not licensed our content in any way to third parties to allow the development of these apps. As a result, we cannot support customers who purchase our content through the apps. We would appeal to the Coffee Break community not to download these apps. How do I know if the app is unauthorised / fake? 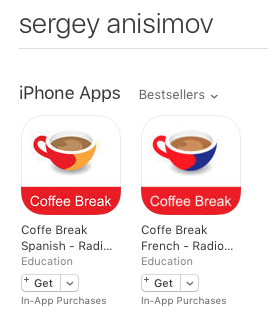 The apps which have been uploaded to the App Store use our logos and the title of the apps normally include “Coffee Break” in some way. You’ll notice that the developers of the apps are not Radio Lingua. Apps have been uploaded by, among others, Sergey Ovseenko, Stanislav Maksimov, QVC Card, Alik Serberov, Alexander Pridachin, Nataliya Krotova, Lyudmila Filatova, Sergey Greba, Sergey Grebenkin, Eugeny Smovdarenko and Michel Thomas (see below). It’s clear that these developers have also created apps using content from other language publishers, including the popular Michel Thomas series, Pimsleur language courses, Earworms and more. We have been in contact with some of these publishers and share their frustration. Why should I bother about this? First of all, the app developers are hoping to make money out of selling our content. However, we’re receiving an increasing number of emails from customers who have been duped into buying the apps, only to discover they don’t work, or that there is no customer support from the developers. Secondly, and more importantly, the developers are blatantly infringing our copyright and trade marks. We are a small company and everyone involved in Radio Lingua is passionate about languages and wants to help to bring accessible learning materials to a worldwide audience. If we spend our time in legal battles with unscrupulous developers, we can’t be making more courses for you. Needless to say, the cost to our company is significant, in terms of legal fees, lost revenue and the time it takes to lodge the App Store takedown notices. This, unfortunately, will affect our ability to continue to develop the content you’re used to. I’ve bought an app – what now? If you have purchased a Coffee Break app through the iOS App Store or the Google Play Store, we would suggest that you apply for a refund through the App Stores. Here’s a link to help you do this for Google/Android and for iOS. By requesting a refund you’ll help to ensure that the developers will not profit from the illegal use of our content. We would also like to hear from you if you’ve been affected: we’re trying to keep a record of customers affected and further proof will help us to show Apple and Google that this situation is not acceptable. Please post a comment on this article and let us know if you’ve been affected. Alternatively, if you prefer, you can forward a copy of your App Store receipt for any in-app purchases you have made for these apps to support [at] radiolingua.com. Please understand that we cannot offer you a refund because we did not sell you the in-app purchase. We make no money whatsoever from the sale of these unauthorised apps. Some affected customers have asked us if they should leave negative reviews for the apps. There’s no doubt about it that if a customer finds an app on the App Store with 1 star or no star reviews then they are perhaps less likely to buy. However, our aim is to have these apps removed as quickly as possible, so we don’t want our valued customers to waste their time leaving negative reviews for apps which will hopefully disappear. Equally we don’t believe in creating more negativity from an already very negative situation: we’d rather these apps were simply removed from the App Stores. What about an official Coffee Break app? Good question! In fact, we started the process of developing an app years ago, but were met with issues from the App Stores because our app plans replicated functionality of the podcast apps. Unfortunately the App Stores do not seem to be as stringent in letting through the unauthorised apps! 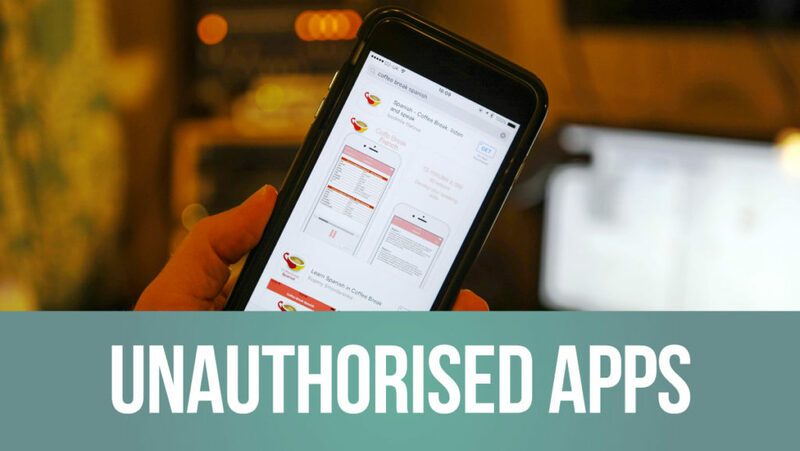 More recently we revisited the development of an app for our Coffee Break courses, but with the constant admin required to deal with this frustrating situation with the unauthorised apps, we have temporarily put the app on hold. Our new Coffee Break Academy courses can easily be downloaded to mobile devices using a third party app such as Documents, and we know that many of our customers who have moved their content into the Academy are very pleased with the ability to store their course files on their devices. One thing is certain, as soon as we do have an official Coffee Break app available, it will clearly state that it is published by Radio Lingua Ltd, and you’ll have heard all about it through our newsletter, on our social media profiles and here on the website. Finally, on behalf of our small team here who are disheartened every time we see the apps reappear, I would like to thank you for your patience and understanding. If you have purchased one of the apps we very much hope that you can organise a refund quickly from the App Store, and we would be delighted to see you on the Coffee Break Academy where you can purchase the authentic courses. It has come to our attention that the apps have been once again uploaded to the iOS App Store under the name of Sergey Anisimov. This time the developer has chosen to call the apps “Coffe Break Spanish – Radio Lingua Network – audio” [sic]. Please note that these apps are illegal and the developer is attempting to sell in-app purchases of stolen content to customers. We have submitted the legal data to Apple again (for the 14th time) and trust that the apps will be removed from the App Store soon. Please do not download these apps. All Coffee Break courses can be found on the Coffee Break Academy. I was glad to find this information even though it was too late as I did purchase the fake app on iTunes. A couple of years ago I was listening to the coffee break podcasts in Spanish and enjoyed them very much. When I found the app on iTunes I purchased season 1 which I could not download. I have emailed support at iTunes. Hope to get my money back. I noticed that the app was acting strange so I located your website to get more info. Hi Donna. We’ve had a number of queries about a new app by Eugeny Smovdarenko which doesn’t even work but he’s still selling the app. Thank you for coming to our website to check. I am someone who got your app from the ap store. Thanks for the info, I wondered why I couldn’t rate you, just got linked to some Russian site. Very sorry to have been part of this scam. Your French course is absolutely fabulous! I also downloaded the Coffee Break Italian app and I am so upset I paid the money. I requested a refund from the app store. I agree we shouldn’t support this piracy! If I get a refund, I will subscribe on your website. I am so upset. 🙁 Maybe you should edit the first episode to warn consumers that the app is a fraud. Grazie. Mi piace Coffee Break Italian! Very sad to hear what you guys have to deal with. Not that I have a ground breaking idea. But maybe if someone from your team commented on the more popular fake app reviews about this with a link? I’m sure you guys have thought about this and much more. But I feel for you guys. Love your stuff and will probably but the premium versions soon. Thanks for your suggestion. In order for anyone to review the fake apps you need to have purchased or downloaded the app. Since our main aim is to have these apps removed from the App Stores we don’t want anyone wasting time posting reviews when you could be spending that time learning the language! I am so glad I just stumbled across this on your website or I might have been duped. Perhaps you should place a warning about this in prominent places on your Coffee Break sessions, websites, etc etc. I was thinking of downloading those apps but fortunately took the precaution of coming here first! Nearly bought the app on iTunes. Actually, it’s very good and easy to use although you cannot get the bonus package without paying. Why can you not just bring an app out that is as easy to use as theirs? Yours do seem so complicated to use. Thanks for your comment, Sally. We’re working on it but it’s a slow process to make the app we want to make! The courses at the moment are available within the Coffee Break Academy where you can either work online, or download all the materials and manage them through a 3rd party file manager app like Documents for iOS. Hi Mark. I was just wondering how many podcast episodes there are of coffee break Spanish? I am on episode 24 and thoroughly enjoying it on my walk to work every morning. Didn’t realise it was recorded nearly 10 years ago! Hi Martin. There are four main seasons of Coffee Break Spanish, each featuring 40 lessons. In addition we’ve also released two seasons of the Coffee Break Spanish Magazine (10 lessons each) and one season of the Coffee Break Spanish Espresso (10 lessons), so 190 episodes in total. Hope that helps. I downloaded the newest illegal version of coffee break French and purchases the first season four weeks ago. But I couldn’t download anything other than the first 14 lessons. I will report to ITunes. However, I still don’t get it, how am I gonna get your authorized version? Where can I download or have an access to? Hi Hanxiao. You’ll need to claim a refund from the App Store and normally there’s a one-month limit on claiming a refund, so we would suggest that you do so as soon as possible. There’s more information in the article above about how to do that. In terms of accessing the official version of Coffee Break French, you will have to buy Season 1 on the Coffee Break Academy. Here’s the link. Hope this helps. I haven’t purchased any apps but I have subscribed to the podcasts of coffee break languages in iTunes. Are they fake as well? Thanks! The podcasts in iTunes are not fake – they are the original materials. Hi, Mark. First of all, your podcasts are fantastic. I’m a professional translator and now offer Spanish-English as a working combination, including to a number of major institutions, thanks (in part, at least) to the extremely helpful and insightful content of your shows. With specific reference to your post above, thanks for raising awareness. I now realise that I downloaded an illicit app from one of the named developers (although a Michel Thomas one some time ago, not a Coffee Break one). I will try the refund process with Google Play. Most importantly, though, keep up the amazing work! Thanks for your comments, Ed. The developers have also ripped off other language learning programmes including the Michel Thomas courses. Have you removed your podcasts from Spotify? Not as far as we know, Henning. Which podcasts are you referring to? Went to the App Store last week and bought what I thought was the “Official” Season 1 & Season 2 of Coffee Break Italian. My suspicions were raised when only Season 1 downloaded plus the bonus lessons for Season One which were labelled Season 2. When my husband and son checked, it became apparent I had been duped by a “Fake” app which allegedly has been sold by a legitimate seller namely the Apple Store on more than one occasion. How can this be!? I was shocked and upset as I have never purchased from the Apple Store before and will now be reluctant to do so again. If I am lucky enough to get a refund, which hopefully I should be able to do as I am within their 14 days refund policy (but who knows if Apple Store has allowed this to happen in the first place? ), I will purchase the entire course directly from the Coffee Break Italian /Radio Lingua official website as I think the course is presented in a clear and accessible format. Hi Sharon. Unfortunately this is indeed the case. We have been through the legal process 20 times with Apple and each time the developers just upload the apps again. Hopefully you’ll be able to get a refund which you should do since you’re within the refund period. Please go to http://courses.coffeebreakacademy.com to purchase Coffee Break Italian. This is sad to read. I haven’t bought an iOS app, but out of interest took a look and even now, a year on from the posts here, there is a fake App for sale on the Apple App Store. Hope you can get this sorted out once and for all. Hi Andrew. Yes, unfortunately there has been a reappearance of the app this week. We’ve already submitted the notification to Apple and hope that the app will be removed soon. The fact that the developers claim this is the “official” app doesn’t help. At least this explains why I can’t gind what I want on the app and why it doesn’t work very well. I love the program and will get it the proper way now. Don’t bother trying to get a refund from Apple. They just automatically deny it. Any luck getting the app removed again? I’m really upset that I paid $60 for it. I don’t know how to get Apple to refund my money when they don’t even consider your request.